On May 10, 1869, the final spike in North America's first transcontinental railroad was driven home at Promontory Summit, Utah. 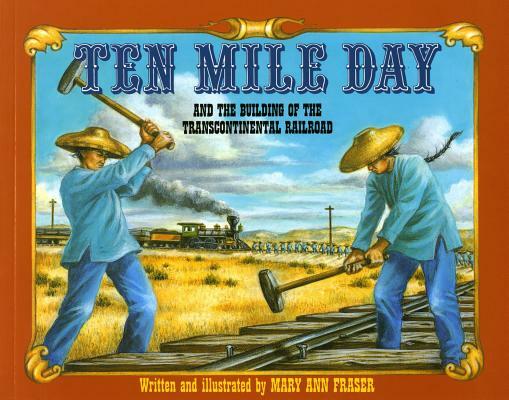 Illustrated with the author's carefully researched, evocative paintings, here is a great adventure story in the history of the American West--the day Charles Crocker staked $10,000 on the crews' ability to lay a world record ten miles of track in a single, Ten Mile Day. Mary Ann Fraser has illustrated more than forty books for children, and is the author-illustrator of a growing list of popular middle-grade books that focus on U.S. history. Her In Search of the Grand Canyon was voted a Best Book of the Year by School Library Journal and Ten Mile Day was an American Bookseller Pick, of the Lists. A graduate of Exeter College of Art Design, she lives with her husband and three children in Simi Valley, California.